Significant and popular squares from around the world. A square is a place usually situated in the center or heart of a city where people meet or gather for recreation purposes, political purposes and other purposes. Here are 8 of the worlds most popular and significant squares in the world. This squares, one way or the other, played a vital role in shaping their country’s history. One square with great historic significant is Decembrist Square, a popular square located in Russia, now known as Senate Square and is formerly known also as Peter’s Square before 1925. It is a city square in Saint Petersburg, Russia. The square is located on the left bank of the Bolshaya Neva right in front of Saint Isaac’s Cathedral. In 1925 it was renamed Decembrist Square to commemorate the December Revolt, which took place there in 1825. The Decembrist revolt or the Decembrist uprising took place in Imperial Russia on December 26, 1825. Russian army officers led about 3,000 soldiers in a protest against Nicholas I’s assumption of the throne after his elder brother Constantine removed himself from the line of succession. Because these events occurred in December, the rebels were called the Decembrists. This uprising took place in the Senate Square in Saint Petersburg. In 1925, to mark the centenary of the event, it was renamed as Decembrist Square. The revolt was suppressed by Nicholas I. One of the few famous squares in Asia is Azadi Square, a very famous square in Theran, Iran where the Azadi tower is situated in the middle of the square. Azadi means “freedom” in Persian. Called Shahyaad or Remembrance of the Shahs (Kings)”) Square before the Iranian revolution, it is the place where many of the demonstrations leading to the Iranian Revolution on December 12, 1979, took place. Another popular square located in Asia is Tiananmen Square, the largest open-urban square in the world. It is a historic large plaza near the center of Beijing, China’s capital. It was named after the Tiananmen which literally means “Gate of Heavenly Peace” which sits to its north, separating it from the Forbidden City. It has great cultural significance as a symbol because it was the site of several key events in Chinese history. Outside of China, the square is widely known for the Tiananmen Square protests of 1989 where hundreds of students who participated were allegedly killed by government soldiers by indiscriminately firing at them. In Europe, UK in particular, one of the most popular squares is the Trafalgar Square, a square in situated in central London, England. It was formerly named King William the Fourth’s Square. Because it is situated in the heart of London, it is a tourist attraction; its trademark is Nelson’s Column which stands in the center and the four lion statues that guard the column. The name commemorates the Battle of Trafalgar of 1805, a British naval victory of the Napoleonic Wars. Another outstanding square that can be found in Russia is Red, the most famous city square in Moscow, and arguably one of the most famous in the world. The square separates the Kremlin, the former royal citadel and currently the official residence of the President of Russia, from a historic merchant quarter known as Kitay-gorod. As major streets of Moscow radiate from here in all directions, being promoted to major highways outside the city, the Red Square is often considered the central square of Moscow and of all Russia. Another distinct square in Europe is the Grand Place, a well known square for its large “flower carpet”. Grand Place is the most important tourist destination and most memorable landmark in Brussels next to the Atomium and Manneken Pis. The display of begonias is arranged on the square every two years for a few days in the middle of August, and attracts many tourists. In Dutch, it is called the Grote Market and Grand Place in French. It is the central market square of Brussels, the capital of Belgium. Square is called piazza in Italian. Italy has many popular squares or piazzas, one of which is Saint Peter’s Square, known in Italy as Piazza San Pietro. This famous square is located directly in front of St. Peter’s Basilica in Vatican City, the papal enclave within Rome. 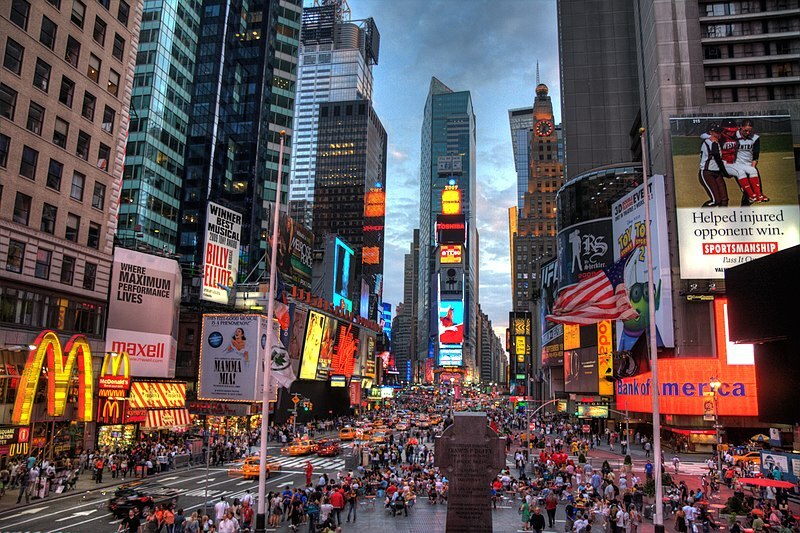 In North America, particularly in the US, Times Square is one of its most popular squares. It is located in Manhattan, New York City. This famous square is formerly called Longacre Square. Times Square was renamed after the One Times Square (formerly Times Building), the former offices of the New York Times, in April 1904. Times Square has achieved the status of an iconic world landmark and has become a symbol of its city. Times Square is principally defined by its animated, digital advertisements. Hope you enjoyed this. Thank you! Why is Greenland Just an Island Not a Continent?